Description : South Beach Flyers is the best place to find out what's happening in South Beach. Flyers highlighting businesses, events, products, and services are updated and displayed frequently to keep visitors coming back regularly to find out what new and exciting things are going on. Flyers are scanned, uploaded to a web server, and logged into a database. People can then visit www.southbeachflyers.com to find out what is happening in and around South Beach no matter where they are. The use of a database allows South Beach Flyers to put flyers into categories such as clubs, bars, restaurants, etc. such that people can browse whatever flyers are of interest. The use of a database also allows South Beach Flyers to specify an end date for each flyer (if relevant) such that out-of-date flyers will not be displayed. Flyers can be for events that have a specific date (such as a fashion show at a club), or for regular events (such as a theme night every Wednesday at a club). It's time consuming and expensive to keep your business web site current in terms of upcoming events, services, etc. 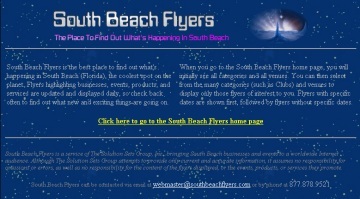 South Beach Flyers can automate that process by providing embedded content for your web site. This allows you to keep your business web site current without any additional work on your part. Content can be restricted to a category or a venue, thus allowing businesses to show only relevant flyers as part of their web site. Content can also be provided with the same web page design as your own web site, so the content truly appears as an integral part of your site. If a business so desires, the embedded content can also include an automated email list capability. For more information, visit www.southbeachflyers.com/services.